We are your Fun and LOCAL art studio, with over 200 paintings to choose from, we help you promote creativity and you leave with sense of accomplishment. Anyone can do it! Our beautiful studio provides a welcoming, encouraging and judgement free atmosphere. Team building activities are a great way to reduce employee stress, increase productivity, and promote creativity in your business. With no experience necessary, painting serves many purposes: Painting is fun and calming! * It helps improve communication, collaboration and idea generation. * Great morale booster! * Encourages teamwork. * Fosters openness to change. * Increases drive, focus, coordination, and concentration. * Boosts self esteem. CANVAS DIY: Create your own work of art from start to finish, with easy to follow, step-by-step instructions while socializing and encouraging one another. CANVAS SWAP: Change seats every 15 minutes! Challenge co-workers to pick up mid-project, assess current progress, analyze next steps & evaluate how to move ahead towards a finished project. Our studio provides a unique space to host your next event. We can accommodate from 10 to 44 people in house, or up to 150 off-site for your next retirement party, team building event, holiday party, meeting, birthday party or fundraising event. The possibilities are endless. Contact us and come for a visit to check out our charming space! Or if you prefer, we can come to you, we are fully mobile! We love collaborating with local businesses! Recently we had the pleasure of working with Stacey and Kim from Soul Sisters Bracelets. Two workshops, one night! Social Artists created rustic jewellery hangers for their walls, and designed beautiful diffuser bracelets. Next week, we are so excited to have another awesome collaboration coming up! Caribbean travel expert Amanda Drexler from Drexler Travel will be joining us Thursday, May 31 to help you discover your perfect sunset! She will be educating us all on land vacations vs. cruises! Relax, daydream a little... and then paint a perfect sunset, complete with palm trees! There is a great prize up for grabs, and travel offers for all attendees! Click here for more info! And Tuesday, July 10th... get ready to make dinnertime easier! We are joining forces with SupperWorks in Waterloo for an evening of meal prep and painting! Choose your entree from their mouth watering menu, and get down and dirty in their kitchen creating a delicious dinner that will serve 4-6 people. They've done the shopping, cleaning, chopping... and they even do the clean up! 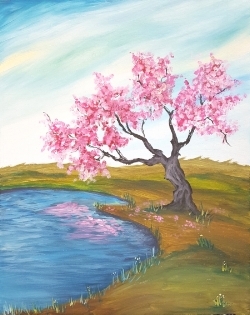 Then sit down, relax and paint "Blossom Reflections" with us. You'll be taking home a meal and a masterpiece! Being productive has never been so FUN! Register today! Do you know of any awesome local businesses that would be a great fit for a Social Art collaboration? Let us know in the comments! We want to celebrate all things local, and fellow entrepreneurs. Art your way! Check out our Drop In Days! What can you expect at a Social Art Drop-In Day?